Saint-Jerome, the gateway to the Laurentian Mountains – is a small town located north of Montreal. 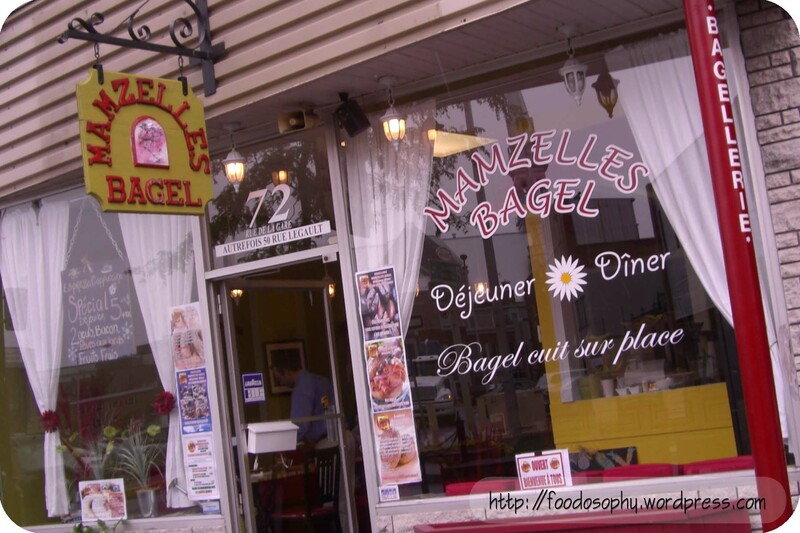 We stopped in for a quick bite before heading out to Mont Tremblant, and found this bagellerie. “Looks cute” says my wife. What caught my eye more than the ‘cuteness’ factor, was the sign stating “Bagel cuit sur place” (Bagel baked on premises). The menu listed just a handful of bagel options filled with your standard items of ham, turkey, and tuna; but I chose the club au poulet (Chicken club). Served with a nicely prepared salad, this bagel sandwich was straight-out delicious. The shredded chicken was lightly dressed and (although hard to see from the photo) was plentiful enough to make this a fully satisfying lunch. Granted I wasn’t even born then, but pretty amazing to realize just how long this business has been around. I’d love to see images from its early days (probably in a different location) and visualize in my mind of how it was probably one of the early (and few) restaurants offering Japanese cuisine in this city during the sixties, but that is now filled with so many of them (the majority being very poor in quality and taking too many creative liberties in the kitchen and behind the sushi bar). 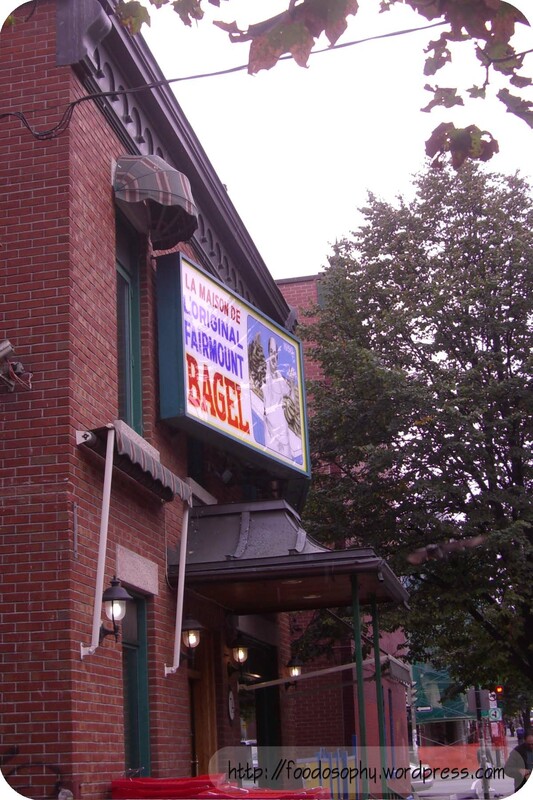 Montreal’s first bagel bakery, continues the tradition with a time-tested recipe of hand-rolling, and baking in a wood burning oven. This is another perfect example of a single store, making one thing, really, really well. I enjoy bagels, but growing up in Western Canada, my exposure to this carbohydrate packed treat has been limited to those available in grocery stores or the local donut shop. When we arrived at this bagel factory, I’ll admit that we were overwhelmed with over 20 varieties to choose from. So, we asked if the purveyor would choose a dozen of his favorites, plus a couple of the ones which just came out of the fire. My neck of the woods has a few gems when it comes to simple but cozy cafés that pump out solid sandwiches. I’ve written about some of them previously: Coco et Olive, and Pane e Formaggio. A hearty but incredibly satisfying part of MIX’s menu are their homemade soups. With the weather turning for the worse as we head towards winter, I can’t think of a better way to get a meal going. On this day, they had a trio of offerings: a pork adobo, a butternut squash, and pictured above, a corn chicken chowder. Filled with healthy vegetables including onions, potato, celery and flavoured generously with cilantro and cumin, it was not fully creamy like a seafood chowder would be, but not totally thin and liquid-y in consistency either. The large size take away container (three inches high, and four-and-half inches in diameter) was plenty for two. After a few hours of exploring Old Charlottetown on foot, the sun was starting to fall out of the sky and we happened to find ourselves at Off Broadway Restaurant (which matched one of the places I had scribbled down from my quick search earlier that morning). With no reservations, we were still able to get a table in the back of the restaurant. Exposed brick and dark woods made for a romantic space. The featured Table d’Hote, and accompanying wine flight ($18) seemed interesting, but I still had oysters on my mind from earlier that day, and a desire to try the local scallops. My wife on the other hand, just couldn’t pass up anything with lobster. Sushi Shoot ($3), essentially seared tuna. [prefectionist1] It seems that whenever I get together with Shokutsu, we tend to have the same approach to menu selections… Either we go for the most obscure, or the most traditional items. My thought process is that if you are going to push the culinary boundaries, go to the extreme; if you go traditional, do it right and have respect for the original creation. The menu at Kanpachi was straightforward with everything on the menu being relatively inexpensive. The first choice for dinner this evening was the Sushi Shoot which was just a fancy name for seared maguro (tuna) nigiri sushi. On the palate, the ponzu infused diakon overpowered the delicate flavor of the maguro. [shokutsu] I’m all for light searing, especially when it involves quality maguro (tuna). I think we were more intrigued by the name of the item more than anything else. The fish itself was pretty good in terms of its texture and flavour. On the topping, I’m with prefectionist1, it didn’t do much for me either. I wanted to like Blue Water. I really did. The Blue Water Cafe and Raw Bar, from all appearances, was everything i wanted to like. They are in a nice space that isnt too pretentious and has a lot of energy. They serve environmentally sustainable seafood. The service was immaculate. Decent wine program. They even recognize the Japanese approach to seafood, and brought in Itamae Yoshihiro formerly of Yoshi’s on Denman to serve two very different styles of West Coast seafood. I really wanted to love it, and yet, i didnt. Upon walking into Blue Water, we were immediately greeted by a friendly hostess. We had showed up early so we could have a seat at the bar, and take it all in. Our bartender was busy – prepping drinks for tables, and other bar patrons, but took the time to let us know he’d be right with us. Through the course of our time there, he was friendly, efficient, helpful, and engaging. Besides the really tasty (and free) bread sticks that are available at the bar, we wanted to sample some oysters. While we were handed an oyster menu with 12 or 14 choices, listed, they typically only bring in 6 to ensure maximum freshness. We sampled these extensively, and while not all were to our tastes, they were all very fresh. We did find a couple that we loved, and ordered several more of those!